Beverley was born and bred in Stoke on Trent. Beverley was educated in Stoke on Trent before leaving the City in 1980 to study Architecture in Leicester. She became ARB registered in 1987 and registered with the RIBA in 1988. Beverley has extensive experience predominantly working in the Education, Healthcare, Office and Residential sectors built up over the last thirty years. Beverley has also built up experience in the Production and Industry, Community, Masterplanning and Retirement sectors. In 1986 fresh out of University she moved to London to work for Chamberlain Powell Bonn Architects who at the time were completing work on the Barbican Centre and also had a team of Architects working on the £200m Chelsea Harbour Development close to their Kings Road offices. In 1987 she moved across London to work for the Mayfair office of Hunter + Partners a 350 strong practice of Architects and Surveyors. Here she officially qualified as an Architect; and worked on Residential and Commercial developments for Clients such as:- the Crown Estate, Grosvenor Developments, Scottish Provident, Scottish Widows, ASDA, Curry’s, Waitrose, The BBC, L’etoile Properties, and a number of Private developers and well to do Private Clients. 50% of the projects were Listed Buildings, Buildings of Significance and High spec refurbishments, 50% of the projects were new build. In 1996 she worked on a project for H+P at BBC Woodlands Worldwide TV Centre. Later that year Beverley moved to work for the BBC Building Services dept at White City working for the BBC on the re-oganisation of the Worldwide TV offices and Television Centre in White City. 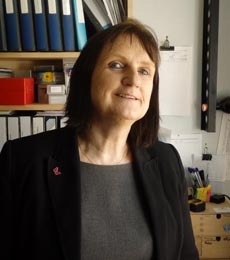 Her stay in South Wales was to last for 7 years before the pull of family and friends in the North Midlands won and in December 2002 Beverley returned to Stoke to live. In Jan 2003 she Joined Austin:Smith Lord in Warrington:- here she worked on a number of Office buildings on the Knowsley Business Park - notably a new HQ for Knowsley Housing Trust; Boulevard Industry Park Speke Liverpool - Design and Tender of a new Fluu Vaccine Production plant; Dagenham Ford Diesel plant; and a Barn Conversion development to create four luxury dwellings with a ‘footballers wives’ price tag for Janvier. From December 2003 to July 2011 Beverley moved to Hulme Upright based at Festival Park in Stoke on Trent, as an Associate:- Clients here were Barrett Developments, Swift, Countryside Properties, Staffs University, Location 3 Properties, Job Centre Plus rollout, Walsall MBC Education Dept, ExtraSpace Solutions, Reaseheath College & South Staffs and Shropshire NHS Trust. In 2011 HU went into receivership due to the pressure of the recession. Beverley is a former active volunteer with Girlguiding UK having held the positions of Guide Leader (9yrs), Division Outdoor, Division Camp Adviser and Division International Adviser for a number of years; due to business commitments she has had to step down as Guide Leader and now acts as Group Support for Stockton Brook Scouts and Guides. 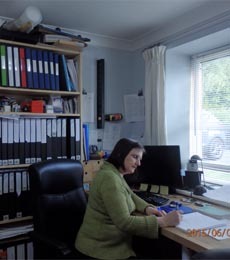 Beverley is Secretary of RIBA NW Solo Principles Group. Beverley is keen on everything outdoor, from her days in Scout and Guiding, as a member of Canoe/Kayak and Sailing Clubs. Beverley in the past has enjoyed Kayaking, Abseiling, Canyoining, Walking, Mountain biking, but age has meant toning down activities to a more leisurely pace these days. Beverley has a black labrador called Oscar who comes to work every day.